Electricity rates: If you live somewhere with high electricity rates compared to other regions, your solar energy savings will be higher thanks to avoided electricity costs. 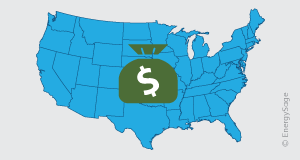 Local financial incentives: If your state or local government offers cash rebates, tax credits or incentives such as SRECs, you’ll save even more. Solar financing: There are three major solar financing options: cash purchases, solar loans, and solar leases/PPAs. Each option offers a different value proposition and long-term return. Advantages of solar energy: How much would you save? The example below illustrates what your basic savings might look like before applying any state or local incentives, depending on how you decide to finance your solar panel system. For this scenario, we’ve assumed a monthly electric bill of $100, and an annual electricity rate increase of three percent. The net installation cost equals the total cost of going solar minus the 30 percent federal tax credit for solar. Keep in mind that under the assumptions above you would expect to pay your utility approximately $25,000 for your electricity over the next 20 years. This $25,000 is the “cost” of not going solar. For a more accurate estimate of the savings you can see by going solar, use our free Solar Calculator. Our Solar Calculator analyzes your roof, real-time cost data, and applicable incentives in your area to provide you with a tailored estimate of how much solar can save you. State, municipal, and utility tax credits and rebates: Depending on where you live, you can significantly reduce your out-of-pocket costs with cash rebates and tax credits. Like the federal investment tax credit (ITC) for solar, some states will allow you to deduct part of the cost of your solar energy system from your taxes. You may also be eligible for a cash rebate, usually priced per watt, from your state government or utility. Solar renewable energy certificates (SRECs): If you live in Delaware, Maryland, Massachusetts, New Jersey, Ohio, Pennsylvania, or Washington, D.C., you can sell the SRECs that your solar panels produce for extra income. While the price of an SREC varies depending on where you live, they can significantly improve the value of your solar panel system. Examples of the additional financial benefits you can receive by going solar are below. However, remember that financial incentives vary significantly from state to state. In order to fully understand how much you can save by going solar, we recommend using EnergySage’s Solar Calculator to get a tailored estimate of your savings when you buy (in cash or with a solar loan) or lease a solar energy system.